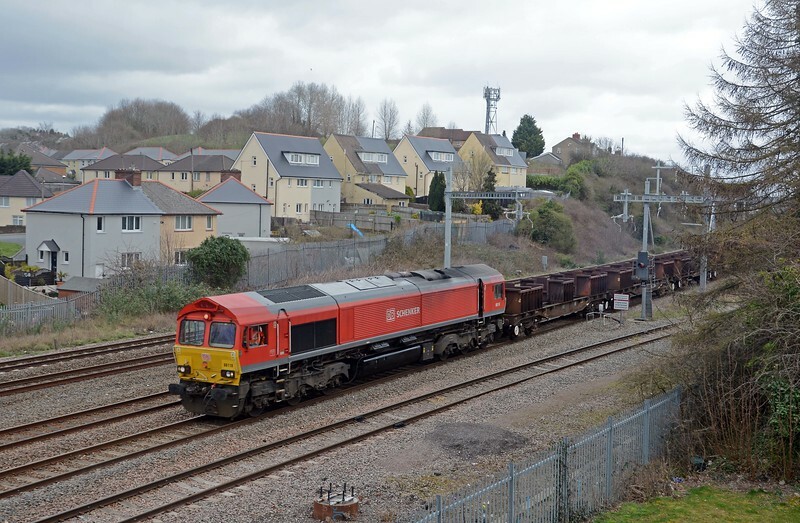 I went down to Newport in the afternoon hoping to see a 6F07 DBC STP from Margam to Newport Docks, but although I stopped alongside Courtybella Sidings at 12:45 I think it had already gone down to the docks, running very early. RTT had it leaving Courtybella at 13:35 and arriving in the docks at 13:46 but I can't see how that was right, as the sidings were occupied by the Margam empties. Now the list of DBC STP metal moves had the 6F07 running Monday and Tuesday, and sure enough it ran again on Tuesday. This time I headed down to Newport immediately it popped up on the Freightmaster Port Talbot realtimemap. It was still a close run thing, I was parking up just as 6F07 pulled out of ADJ Yard and into Newport's Courtybella sidings. I then drove round to Pillgwenlli in time to see it on the docks branch, running about two hours early! After a week of pretty tempestuous weather Monday 18th brought some relief. It was brighter than I had been led to expect and remained dry, at least whilst I was out. Newport's rail connected docks and wharves were busy handling four trains carrying steel and tinplate for export, two each for Birdport and South Dock. I also managed four shots of 6M86: passing ADJ Yard, leaving Llanwern, crossing the Usk at St Julian's and near Pandy between Abergavenny and Pontrilas. The final week of the month was amazingly mild and sunny, at least in our part of Wales. On one day, Tuesday I think, the town of Usk was the warmest place in the UK at 16C! On Thursday 28th we flew to Amsterdam for a weekend with frends who have settled in the Dutch capital. I had a few hours free on Saturday morning, taking myself pff to Sliedrecht in the south of the country along the Betuweroute. It proved quite a productive morning. I also took some pictures of trams in Amsterdam and Den Haag.